Open wide and say ahhhhhhh! In medieval Europe, Hellmouths were commonly depicted in illuminated Apocalypse manuscripts as hideous beasts, swallowing the souls of the damned, while the souls of the saved watched smugly from Heaven. The British Library has posted some of the most memorable images in their collection. 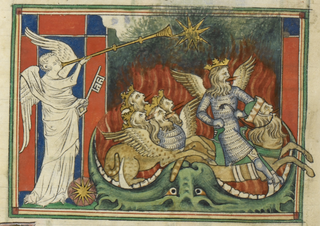 "The rather horrifying motif of the Hellmouth was not confined to medieval manuscripts," the British Library notes. "It appears—most commonly as a hairy, fanged beast —in stained glass windows and wall- and panel-paintings as well. It was therefore visible to ordinary medieval people, for whom owning an illuminated manuscript was an unimaginable luxury, and the prospect of suffering an eternity in Hell an imminent possibility. "